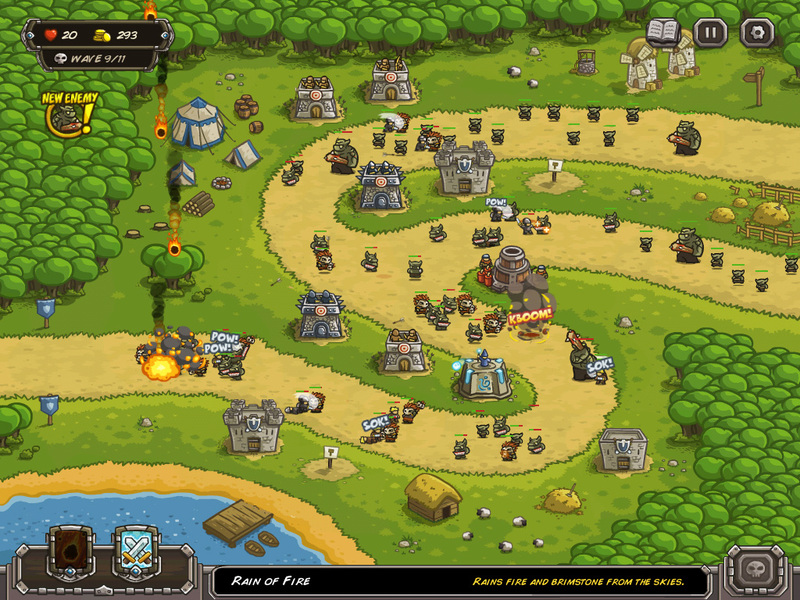 Kingdom Rush is a cool little tower defense game set in a medieval fantasy setting and it’s available on the app store and Google play but can also be played through a browser. It’s a tower defense game so you set up your defenses as waves of enemies try to get passed you in this case the enemy are orcs and goblins at first , the aim is to try not let any get past you but if only a few get past it’s okay to complete the level. The defenses you place are archery towers, mage tower, barracks, and dwarven bombers at first but you can unlock many more, and you place them on designated spots, you can also upgrade these in play to make them better in some way. Also in play you can use two special abilities that are on a cooldown, I was using reinforcements which lets you play men anywhere on the map and a meteor strike which you can rain down on enemies in a certain area, this keeps you involved in the game rather then just watching. Once you’ve completed a level you get a star rating which can be spent on upgrades to improve certain aspects of your towers for example it cost one star to improve the range of the archer tower. The stars are also used to purchase heroes, I didn’t collect enough stars whilst I was playing so I’m not sure if you can control them or you just place them on the map and watch them but it adds an extra feature. You also earn achievements, unlock challenges on maps you’ve completed and there’s a huge range of different maps in different settings so they look different, this keeps the game fresh. It is a competitive game so goes into the Agon category because you’re competing on leaderboards against other players and friends, you are also kind of competing against the computer as well. It also falls into the mimicry category because you are acting like a general places your defenses to defeat the enemy. When I first started playing I would say I was in a state of control on the flow diagram but as I got further along and the difficulty increased I started to achieve flow. It’s a really fun game to play and I’d say it’s one of the best browser games I’ve played. It’s good to look at even though the graphics are simple and you are in control at all times, so you can build, upgrade, use your ability’s when you want and not just between waves like a lot of tower defense games used to be like, this keeps you engaged as well as all the different enemies, unlocks and maps. Experimental Shooter is a point and shoot game, each level is different but you are always stationery turret that shoots. At the beginning of each level the title gives you a clue for how to complete it, for example there is one that says ‘turn off the lights’ and the white circles are stationery and you’ve got to hit each one to turn it off but if you hit an already turned off one it comes back on. 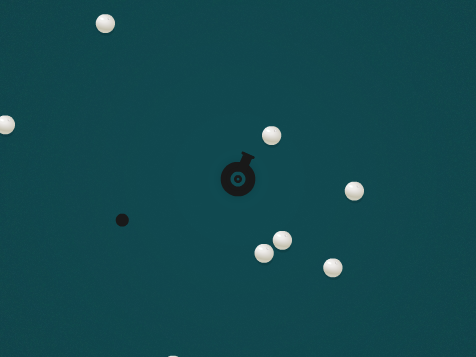 Another example is one one called ‘hit the walls’ in this level you have to hit all four walls whilst with one bullet and avoiding all the white circles, all the levels are very different and there are a lot of levels so the variation is quite impressive. The score for each level is how long you take to complete it, it counts down from 5000 and the higher the number the quicker you have completed it, this is used for the leaderboards where you can look how well you’re friends have done. Because of the leaderboards this game falls into the agon category as you can compete against your friends and other people on the leaderboard. It also falls into mimicry because you are playing as a turret and repeating the same action of shooting over and over again. I would probably also put it into the illinx category because some of the levels get complected. I didn’t reach a state of flow whilst playing but I did enjoy the game its quite inventive with all the different types of levels and the way it keeps you playing even though you are a stationery turret in every level. On the flow diagram I would say I was in the control section as the challenge wasn’t massively difficult but I didn’t finish the game so may have gotten more difficult, but overall a well thought out game.